Physical Therapy Aide jobs are highly sought after positions for active people who want to help others in a physical rehabilitation setting. 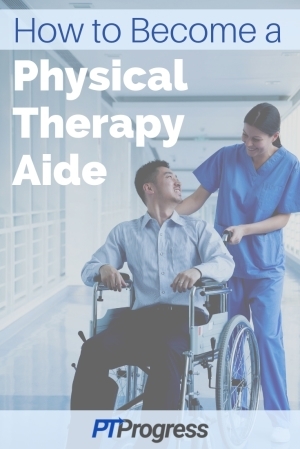 Working as a Physical Therapy Aide, also known as PT Technician or Rehab Aide, will give you an opportunity to assist Physical Therapists or Physical Therapist Assistants as they provide therapy for patients. PT Aides can work in clinic settings, hospital groups, or other health facilities that employ Physical Therapists. In order to be a Physical Therapy Aide, you must hold a high school diploma or GED and be willing to perform various tasks, which may include any of the following. It’s important to know that a PT Aide does not physically perform therapeutic exercise with a patient. This is the job of a licensed Physical Therapist or Physical Therapist Assistant. A Physical Therapist Assistant is different than a PT Aide in a number of ways. First, a Physical Therapist Assistant (PTA) must complete a 2 year Associate’s Degree from an accredited Physical Therapist Assistant school. The PTA is a licensed health care provider who can perform therapeutic exercise and other treatments for patients. A PT Aide (not PTA) is not a licensed health care provider and cannot perform therapeutic treatment for patients. How Do You Become a Physical Therapy Aide? A PT Aide does not have to enroll in any advanced training program to work at a PT clinic. On the job training is standard within clinics, so you’ll learn how to be a physical therapy aide at the clinic within the initial weeks of starting. What is a Physical Therapy Aide Job Salary? A Physical Therapy Aide can make between $12 and $15 an hour depending on the setting, location, and size of the therapy clinic. The average Physical Therapy Aide job salary is $31, 805 according to ZipRecruiter, which is in line with the hourly rate of $15 an hour. A Physical Therapy Tech is the same as a PT Aide, so it goes without saying that a Physical Therapy Tech salary will be $12 to $15 an hour. While many positions are considered full time, you may find opportunities that are listed as part time. Pro Tip: Many clinics struggle with marketing and promotions. If you are a creative person and want to explore a job as a Physical Therapy Aide, you may be able to combine your creativity with your work as a Rehab Aide. During your interview, share your interest in helping the clinic with marketing and tell them about your computer skills or social media expertise. Prepares patients for treatments, assist during administration of treatments, and provides routine treatment such as ultrasound or e-stim setup. Think you have what it takes to apply for a physical therapy aide job? If you’re a highly motivated, self-starter who has strong communication skills and takes initiative without prompting, then you’ll probably thrive as a Physical Therapy Tech / Aide. Search for Physical Therapy Aide jobs in your area.